A beautiful panoramic photo of the Aga Khan Museum (left) and the Ismaili Centre (right), connected by the all-season Aga Khan Park. The Museum and the Centre, two architectural and cultural gems in Toronto built by His Highness the Aga Khan, were inaugurated in September 2014 by former Canadian Prime Minister, Stephen Harper. This was followed by the inauguration in May 2015 of the Aga Khan Park by Ontario’s Premier Kathleen Wynne. Both the opening ceremonies took place in the presence of His Highness the Aga Khan. Photo: Flickr photo by Wyllepoon, shared under the Creative Commons Agreement. Editor’s note: This is the second part in our continuing coverage of the 49th Ismaili Imam’s visits to numerous countries that he undertook during 2015, either to launch projects or to participate in important events. This post covers his visits to India in April, Canada in May and Greece in September. For those who missed the first part of the series, please click The 2015 Travels and Accomplishments of a Global Humanitarian and Spiritual Leader, His Highness the Aga Khan. Mawlana Hazar Imam meets a group of students on the campus of the Aga Khan Academy, Hyderabad. Photo: AKDN/Ahmed Charania. In this part, several photos of his landmark visit to Canada have been reproduced with the special permission of the Liberal Party of Ontario. Readers who wish to view the complete suite of pictures taken by the Ontario Liberal Party are invited to view them at the party’s Flickr Account, via the link that is provided at the end of this piece. Readers will be able to view many more photos and also download larger formats for their personal use. Simerg thanks the offices of the Premier of Ontario and the Ontario Liberal Party for the kind permission to use the splendid copyright photos for this post. Photo: © Copyright: Queen’s Printer of Ontario. Credit: Office of the Premier of Ontario. The government of Ontario, under the leadership of Premier Kathleen Wynne, and the Ismaili Imamat signed an agreement to collaborate on mutually beneficial education initiatives in an effort to foster capacity-building and promote the exchange of knowledge and expertise. Projects include the secondment of Ontario teachers to the Aga Khan Academies in Africa and Asia; the creation of opportunities for Aga Khan Academy graduates to attend Ontario’s world-class post-secondary institutions; and the exploration of a range of curriculum-linked resources that emphasize intercultural understanding and that draw on the Aga Khan Museum for its teaching collection and expertise on pluralism of Muslim culture to support learning in Ontario schools. “His Highness the Aga Khan has devoted his life to the values we cherish in Ontario — diversity, pluralism, peace, tolerance and sustainable human and economic development. This agreement reinforces Ontario and the Ismaili Imamat’s shared commitment to these values, and to improving the lives of young men and women here in and around the world through education.” — Kathleen Wynne, Premier of Ontario. “Today’s events reaffirm the Ismaili Imamat’s commitment to Canada and Ontario and to promoting and fostering the values of pluralism and diversity throughout the world. I want to tell you how happy and grateful my community and I are for this agreement that we have just signed. “Our history, our interpretation of our faith is anchored in the intellect and we rejoice in investing in the human intellect. It’s part of the ethics of what we believe in and it’s part of what we believe distinguishes us obviously from the environment in which we live. So the agreement that we have is giving us new opportunities to widen our exposure to education in the industrialized world but to widen that education within a context where our values are the same. “That is very important because it’s clear that with the global community such as the Ismaili community we need to invest in global values, in values which can be applied to any society at any time in any part of the world. “There are three professions in the developing world which are undervalued. First is nursing, the second is education and the third is journalism. And yet all those professions are critical for the development of a quality civil society in the third world and the partnership that you have allowed us to create is going to come in and assist us to reposition one of the greatest professions that we need in the third world. “So I would ask you to think of this not only in terms of what we will be able to achieve in terms of collaboration but in a much wider context of the teaching profession and its position in the developing world.” — Excerpts from remarks made by His Highness the Aga Khan. Ontario Premier Kathleen Wynne on May 25, 2015, inaugurated the Aga Khan Park, a landscaped garden that encompasses the green space between and around the Aga Khan Museum and the Ismaili Centre. The Park, the Museum and the Centre together form Toronto’s newest cultural hub. The Park can be enjoyed all year-round, with trees and plants chosen to thrive in Toronto’s climate. Based on a traditional Persian and Mughal chahar bagh (four-part garden), the formal gardens within the Park provide a place for contemplation as well as areas for public programming or private events. The Premier of Ontario, Kathleen Wynne, speaks at the inaugural ceremony of the Aga Khan Park on May 25, 2015. Greeting the gathering with a Ya Ali Madad, Premier Wynne said that she was honoured at being invited to open the park. “I have been very much looking forward to this event,” she told the audience. “I’m in awe again today at the beauty of this park,” remarked the Premier. “It will benefit all of the communities in the surrounding area, and in the city, and in the province.” Photo: The Liberal Party of Ontario. Copyright. All Rights Reserved. Flickr Photo. “The Aga Khan Park in Toronto will be an added prime example of the inspired, intelligent development of significant open spaces. The Garden has for many centuries served as a central element in Muslim culture. The Holy Qur’an, itself, portrays the Garden as a central symbol of a spiritual ideal – a place where human creativity and Divine majesty are fused, where the ingenuity of humanity and the beauty of nature are productively connected. Gardens are a place where the ephemeral meets the eternal, and where the eternal meets the hand of man. His Highness the Aga Khan is seen delivering his address at the opening of the Aga Khan Park on May 25, 2015. Photo: The Liberal Party of Ontario. Copyright. All Rights Reserved. Flickr Photo. “The tradition of Islamic Gardens places an emphasis on human stewardship, our responsibility to nature and to protect the natural world. We see that principle expressed in the disciplined use of geometric form – framing the power and mystery of nature. “And, of course, the Garden of ancient tradition, like the Garden here today, is a place where – whatever difficult moments may come our way – we can always find, in the flow of refreshing water, a reminder of Divine blessing. A young boy takes a photo of his family at the Aga Khan Park during the Doors Open of the Aga Khan Museum and the Ismaili Centre which was held during the weekend of May 23-24, preceding the Park’s inauguration on May 25, 2015. The Toronto Doors Open Event attracted more than 10,000 visitors to the Ismaili Centre and the Aga Khan Museum over two days. Photo: Malik Merchant/Simerg. “Let me mention one other point of profound connection that we should ponder, and that is the connection across cultures. Think for example, of those who designed this complex. On one side, looking at the Museum, we see the work of a Japanese master. On the other side, looking at the Centre, we see the work of an Indian architectural giant. And in between we recognize the masterpiece of a young landscape artist of Lebanese descent. Visitors enjoy at the Aga Khan Park pond – one of four – during the Toronto Doors Open event held during the weekend of May 23/24. The Park was officially inaugurated by Premier Kathleen Wynne on May 25th in the presence of His Highness the Aga Khan. Photo: Malik Merchant/Simerg. A view of the Aga Khan Museum from the passenger drop-off point at the Ismaili Centre. The Aga Khan Park lies in the centre of Toronto’s two new architectural gems. Photo: Malik Merchant/Simerg. Copyright. 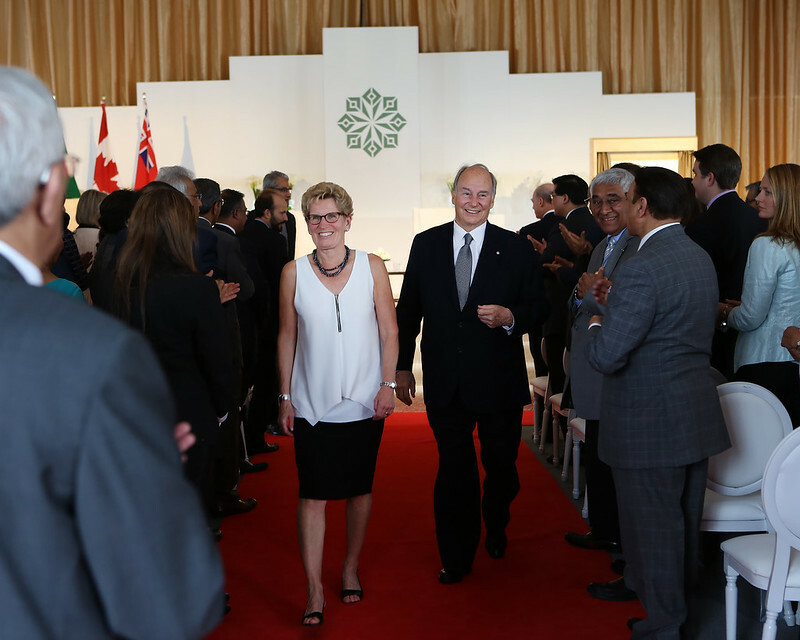 His Highness the Aga Khan acknowledges the standing ovation he receives upon the completion of his speech at the inauguration of the Aga Khan Park by Ontario Premier Kathleen Wynne. Photo: Malik Merchant/Simerg. Copyright. His Highness the Aga Khan and the Premier of Ontario, Kathleen Wynne, shake hands and applaud (below) following the unveiling of the plaque marking the inauguration of the Aga Khan Park. Photo: The Liberal Party of Ontario. Copyright. All Rights Reserved. Flickr Photo. His Highness the Aga Khan waves to admirers and onlookers, who waited on Wynford Drive while the inauguration of the Aga Khan Park was taking place. Photo: The Liberal Party of Ontario. Copyright. All Rights Reserved. Flickr Photo. His Highness the Aga Khan and Premier Kathleen Wynne greet members of the Ismaili Muslim Choir who performed during the inauguration ceremony. Photo: The Liberal Party of Ontario. Copyright. All Rights Reserved. Flickr Photo. His Highness the Aga Khan, surrounded by his younger brother Prince Amyn, and son, Prince Hussain, as well as Ismaili leaders, acknowledges his appreciation on the day’s memorable events that included the signing of the historic agreement with the Government of Ontario and the opening of the Aga Khan Park by Ontario’s Premier Kathleen Wynne. Photo: The Liberal Party of Ontario. Copyright. All Rights Reserved. Flickr Photo. See link below. Mawlana Hazar Imam, His Highness the Aga Khan, accompanied by his daughter, Princess Zahra, and his son, Prince Aly Muhammad, as well as his grandchildren, Sara and Iliyan, was in India for a week-long visit in April 2015 during which he received the Padma Vibhushan and laid the foundation for a site Museum at the Humayun’s Tomb complex. The 49th Ismaili Imam also visited the Aga Khan Academy and met with the President, Vice President and Prime Minister of India. The President of India, His Excellency Pranab Mukherjee, decorates Mawlana Hazar Imam with the Padma Vibhushan on April 8, 2015 at the Rashtrapati Bhavan in New Delhi as part of the commemoration of India’s 66th Republic Day. The Padma Vibhushan is one of the country’s highest civilian decorations, and recognizes Mawlana Hazar Imam’s contributions to social development in India. Photo: The Government of India. Mawlana Hazar Imam visits with the Honourable Narendra Modi, Prime Minister of India at Panchavati, the official Prime Ministerial residence. Mawlana Hazar Imam had also called the President and Vice President at their respective official residences. Photo: The Government of India. Mawlana Hazar Imam visits with Grade 1 students in their classroom at the Aga Khan Academy, Hyderabad. Photo: AKDN/Ahmed Charania. Junior School students welcome Prince Aly Muhammad, Sara and Iliyan to their art classroom. Photo: The Ismaili/Nazim Lokhandwala. Aga Khan Academy student presents her research project about starting a library in a local girls school to Mawlana Hazar Imam. A Grade 11 student, Khushboo, is interested in social change. After volunteering in a Telugu-medium girls school in grade 9, she realised that students did not get exposure to English outside of a handful of lessons each week. She set out to build an English library and reading club in the school to help them improve their English and share her love of reading. “There’s a lot that opens up to you when you read,” says Khushboo. “Books are like another teacher. They provide a stream of knowledge,” she said, adding that the students had improved their reading levels after the programme was established. The research project is a final component of the International Baccalaureate Middle Years Programme. Photo: The Ismaili. Prince Aly Muhammad, Sara, Iliyan and students share a few laughs on the basketball court of the Aga Khan Academy, Hyderabad. Photo: Nazim Lokhandwala. “This Museum, as you may know, has been designed as a Gateway – a Connecting Point – located at the juncture of three historically connected sites: Humayun’s Tomb and its Gardens, Hazrat Nizamuddin Basti, and the Sundar Nursery. “In connecting these sites, the Museum will also serve as a bridge between the present and the past – linking the modern city of Delhi to its remarkable heritage – and thus providing a Gateway to a truly extraordinary period of human history. With the grandeur of Humayun’s Tomb in the background, Princess Zahra, her daughter Sara and Prince Aly Muhammad take in a view of the gardens surrounding Humayun’s Tomb, together with AKTC staff. Photo: AKDN/Narendra Swain. “It was led by men whose talents in statehood and in military affairs were remarkable – and their impact was felt in virtually every dimension of human existence, both within the empire and outside. Many of the Mughal rulers, perhaps most of them, were also exceptional leaders in the acumen and insight which they brought to their leadership roles. They were statesmen who would have excelled in any time. Mawlana Hazar Imam speaking with AKTC staff after touring the Sundar Nursery and Batashewala complex with Prince Aly Muhammad, Princess Zahra and her children, Sara and Iliyan. The Sundar Nursery is a key component of the creation of a wider city park encompassing the restoration of the 16th century garden tomb of the Mughal emperor Humayun. Photo: AKDN/Narendra Swain. “Consider, for example, Humayun himself, who governed an area of one million square kilometers – and who was remembered as much for his peaceful and forgiving temperament as for his military conquests. His rhetoric was said to be non-provocative, his style that of a diplomat. And it was these qualities that were inherited by his son, the Emperor Akbar, who further broadened the Empire – and who strengthened it through a policy of universal tolerance – one that welcomed the vast diversity of his many subjects. “So to use a well-worn but well-considered phrase, it “staggers the imagination” to think of what was created here during the Mughal period, on a scale and with a splendor that had not existed before. And its accomplishments have continued to inspire subsequent generations.” — Excerpts from remarks made by His Highness the Aga Khan on April 7, 2015 at the Foundation Stone Laying Ceremony for the Humayan’s Tomb Site Museum in Delhi, India. His Highness the Aga Khan delivering the Keynote Address to the 2015 Athens Democracy Forum on September 15, 2015. – Photo: AKDN/Gary Otte. “Let me suggest four elements that could help strengthen democracy’s effectiveness in meeting this central challenge. They are: improved constitutional understanding, independent and pluralistic media, the potential of civil society, and a genuine democratic ethic. His Highness the Aga Khan with Stephen Dunbar-Johnson, President, International at The New York Times and Nobel-winning economist Paul Krugman, op-ed columnist at the New York Times. Photo: AKDN/Gary Otte. “Throughout history, the same tools – the printing press, the telegraph, the microphone, the television camera, the cell phone, the internet – that promised to bring us together, have also been used to drive us apart….genuine democratic consent depends on dependable public information. “The danger in an age of mass media is that information also can be misused to manipulate the public. All around the world, authoritarian rulers increasingly use media to “coerce” the consent of the governed.” — Excerpts from Speech by His Highness the Aga Khan at the International New York Times Athens Democracy Forum, 15 September 2015. Date posted: December 23, 2015. Please visit the Flickr page of the Ontario Liberal Party to view many more superb photos of the opening ceremony of the Aga Khan Park. Readers will be able to view and downloaded photos for personal use in 5 different sizes, from thumbnails (150 x 150) to large photos (3000 x 2100). Please visit http://www.akdn.org and http://www.theismaili.org for speeches and detailed reports of all the events noted on this post. For links to everything Ismaili, please visit http://www.ismailimail.wordpress.com. We welcome feedback/letters from our readers. Please complete the feedback form below. Your comments may be edited for length and brevity, and is subject to moderation. We are unable to acknowledge unpublished letters. Please sign-up for blog subscription at top right of this page. It is with immense pleasure that I have gone through the pieces pertaining to the highlights of Mawlana Hazar Imam’s 2015 global travels. Very nice and really memorable. Congratulations for some nice and excellent work. May Moula bless you the ultimate happiness. Ameen. Fabulous coverage, I am so glad that part of Canada’s visit took place while I was able to see it as webcast, the launching of the Park near Museum. Thank you Editor.